Cloudy with occasional light rain during the afternoon. High around 45F. Winds WSW at 5 to 10 mph. Chance of rain 70%..
Showers early, then cloudy overnight. Low near 40F. Winds WNW at 5 to 10 mph. Chance of rain 50%. 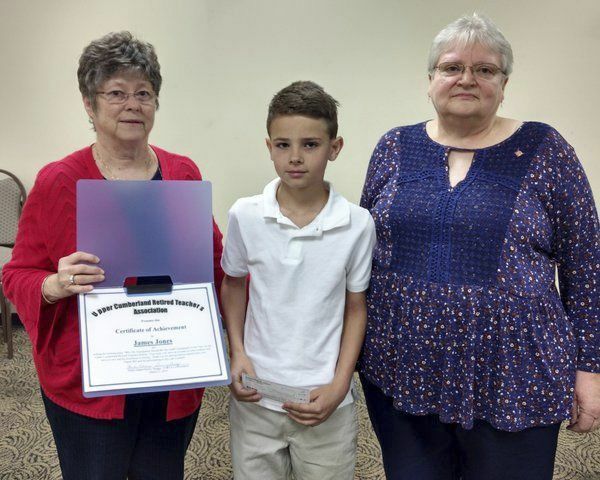 WHITLEY COUNTY — At their March meeting, the Whitley Area Retired Teachers Association (WARTA) had the privilege of recognizing James Jones, son of Edna and Scott Jones and a fifth-grade student at Whitley East Elementary School, as winner of the 2018-2019 AARP/KRTA Grandparent of the Year essay competition. Jones was given the opportunity to read his winning essay and was presented with a check for $25. In addition, it was announced that his winning essay had been selected by the Upper Cumberland Retired Teachers Association (UCRTA) as winner at the district level making him eligible for state recognition. Sherry Skaggs and Paula Adams, co-presidents of UCRTA, were on hand to congratulate Jones and present him with a certificate of achievement. Now, in a letter dated April 5, Jones has been notified by AARP KY that, although not the winner at the state level, he is being congratulated as one of only 14 students, out of thousands who entered, to reach this level. For this outstanding achievement, AARP Kentucky and KRTA have presented Jones with an engraved plaque and a check for $50. For a young man from Whitley County this is quite an accomplishment and the Whitley Area Retired Teachers Association extends congratulations to Jones, his family, and the Whitley East Elementary School, especially Principal Mike Partin and fifth grade teacher Shannon Taylor. Both Partin and Taylor stated Jones is an excellent student and they are really proud of him and his achievement. 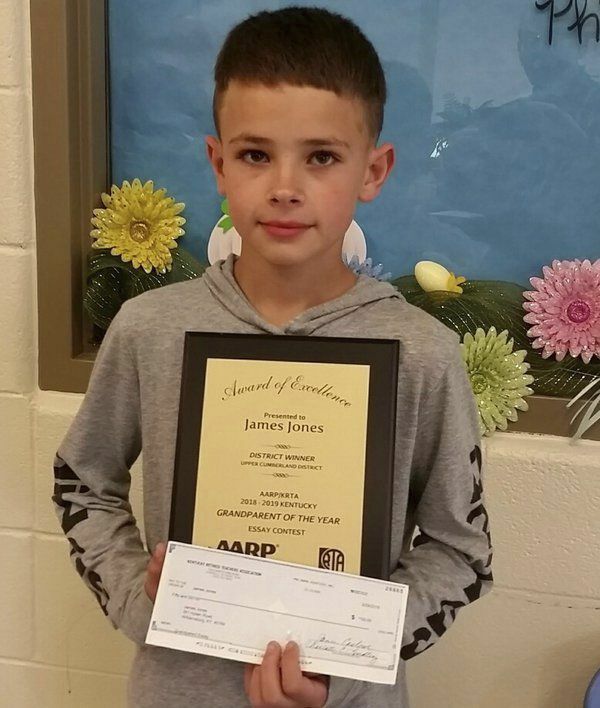 AARP and KRTA co-sponsor the “Why My Grandparent Should Be the AARP Grandparent of the Year” essay contest each year to give fifth graders like Jones the opportunity to pay honor to deserving grandparents who have made a significant impact on their lives. In Kentucky and across the nation, an increasing number of adults 50 and over are the primary caregivers to minor children. The 2010 census showed nearly 87,000 grandchildren in Kentucky live with grandparents who are responsible for their day to day care. WARTA is pleased to participate in this contest that honors the contributions made by grandparents and to recognize and applaud the writing skills of local students.